At Vici, our Campaign Managers are Google Ads Certified in Google Search Ads (also known as Pay-Per-Click). This type of advertising is focused around keywords that are relevant to your business offerings. Our Campaign Managers handle the weekly optimization of your campaign, from building the most sophisticated results-driven ads with up to 4 ad extensions, monitoring bidding on keywords, and driving meaningful conversions to your business; with reporting on lead forms, calls, text messaging, and click to map to your business. What do your Google Pay-Per-Click Ads include? 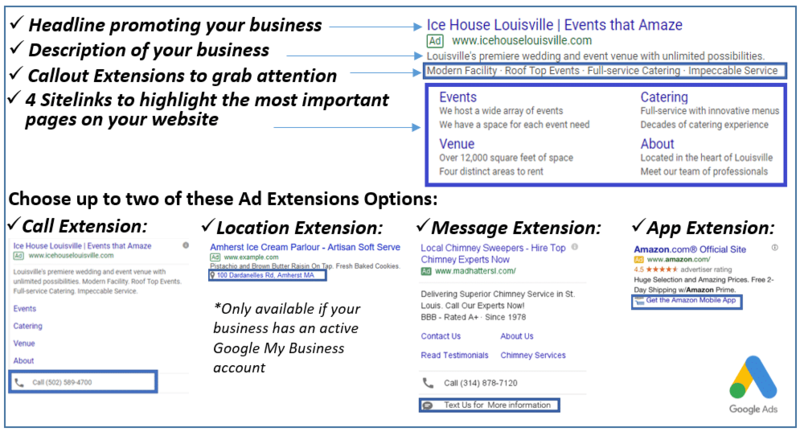 Step 2: The next step is compelling text creation for your ads to make sure you are maximizing your message, using the appropriate ad extensions to capitalize on real estate in the Google search engine results page. Step 3: We will optimize your campaign every week throughout the month to ensure your budget is being spent most effectively. No “set it and forget it” with our campaigns. Top Keywords: Keywords that are driving results broken down by cost-per-click. Conversions: How many people converted both on your ad or on your client’s website?